1. Andrei Kolesnikov article headlined "Rejected in Russian words" reports on President Vladimir Putin's visit to the Jewish Museum in Moscow where he said that the Schneerson library will not be taken out of Russia despite claims by some US Jews; pp 1, 3 (1,439 words). 2. Viktor Khamrayev et al. report headlined "State Duma wants to see Michael McFaul" says that experts believe that the State Duma should better deal with the problem of child abuse at home rather than summon US ambassador Michael McFaul for explanations following the killing of a Russian boy adopted by a US couple; pp 1, 3 (969 words). 3. Vladislav Trifonov article headlined "Loan stolen from VEB given more preferable terms" says that the case of 14m dollars allegedly stolen from Vneshekonombank, involving the first deputy head of the chairman of the bank's board of directors, has fallen apart as the correspondence between the bank and its borrower was made public. It proves that the money in question has not been stolen, in fact; pp 1, 4 (549 words). 4. Vladislav Novyy article headlined "Russian Post shifts from general to specific" says that a large-scale reform of Russian Post is planned as the company will be split into logistic infrastructure and a firm providing people with various post services; pp 1, 13 (765 words). 5. Natalya Bashlykova and Anton Arsenyev article headlined "Mikhail Prokhorov attracts with culture" says that billionaire and leader of the Civil Platform party Mikhail Prokhorov is looking for new members among supporters of other parties. Former members of the Yabloko party are ready to join Civil Platform in St Petersburg; p 2 (608 words). 6. Sofya Samokhina et al. report headlined "Oleg Mikheyev can turn from immune one into defendant" says the State Duma has stripped A Just Russia deputy Oleg Mikheyev of parliamentary immunity. He is suspected of large-scale fraud with a bank loan; p 2 (593 words). 7. Kirill Belyaninov article headlined "Foster parents turn answering machine on" says that no charges have been brought against the US foster parents of the Russian boy reportedly beaten to death; p 3 (584 words). 8. Oleg Rubnikovich article headlined "Relatives' refusal" says that former Defence Minister Anatoliy Serdyukov and his former subordinate Yevgeniya Vasilyeva have refused to answer questions of the investigation carrying out a probe into the Oboronservis corruption case; p 4 (702 words). 9. Pavel Tarasenko article headlined "Britain expects wave from East" says that over 50,000 Bulgarians and Romanians may move to the UK in 2014 as restrictions on their entry will be removed; p 7 (523 words). 10. Mariya Yefimova and Yelena Chernenko article headlined "Libya does not understand Russian-Arabic" says that the Russia-Arab League forum in Moscow will be held without Libya, which has ignored Russia's invitation; p 7 (645 words). 11. Sergei Strokan article headlined "Present for elephants" says that the UK plans to spend 25bn dollars to develop cooperation with India as Prime Minister David Cameron is finishing his visit to India; p 8 (621 words). 12. Article by Konstantin Makiyenko, deputy director of the Center for the Analysis of Strategies and Technologies, in opinion column headlined "Price of issue" compares the visits of Putin and UK Prime Minister David Cameron to India and says that Delhi is stepping up cooperation with the West rather than with Russia; p 8 (372 words). 13. Yelena Chernenko article headlined "Russia invited to Mali" says Russia has been invited to take part in the EU military operation against Islamists in Mali. The proposal was made at the meeting of Russian Foreign Minister Sergey Lavrov and EU High Representative for Foreign Affairs and Security Policy Catherine Ashton in Brussels; p 8 (535 words). 1. Alexandra Samarina and Ivan Rodin article headlined "Alezander Bastrykin to help overseas Themis" says the Russian Investigations Committee is carrying out a probe into the killing of a Russian boy adopted by a US couple. The State Duma wants to invite the US ambassador to Russia for explanations; pp 1, 3 (1.019 words). 2. Igor Naumov article headlined "Payments and state services do not fit in with electronic card" says a project to introduce universal electronic cards in Russia is not being implemented due to a lack of financing in regional budgets; pp 1, 4 (878 words). 3. Ivan Rodin and Sergei Konovalov article headlined "Military day in presidential reception offices" says that Putin's public reception offices have invited servicemen to come on 22 February and share their problems as the authorities are afraid of a possible rise in number of discontent officers; pp 1, 3 (999 words). 4. Anastasia Bashkatova article headlined "Unhappy prospects for Russian milkmen" says Russia's accession to the WTO will result in reduction of domestic dairy production by 1-2 per cent a year; pp 1, 4 (739 words). 5. Tatyana Ivzhenko article headlined "Kiev slaps EU in the face ahead of summit" says the Ukraine-EU summit is to be held amid a scandal over keeping opposition activists in custody in Kiev; pp 1, 7 (1,002 words). 6. Yury Paniyev article headlined "Chinese hackers in uniform wage cyber war against America" says the US company Mandiant engaged in cyber security has accused the Chinese authorities of involvement in cyber attacks on the US government bodies and infrastructure. The company claims it has proof of the Chinese People's Liberation Army's involvement; pp 1, 8 (623 words). 7. Editorial headlined "Currency wars escalate" looks at the measures taken by some Western economies to lower the cost of their national currencies to cope with the economic crisis; p 2 (540 words). 8. Vladimir Mukhin article headlined "Dmitriy Medvedev's explosive concerns" says the Russian federal budget still lacks money to clear the land in Chechnya and Ingushetia from mines; p 2 (638 words). 9. Svetlana Gavrilina report "Muslim patrols in central St Petersburg" says that order and security in the infamous shopping area Apraksin Dvor in St Petersburg will be maintained with the help of enhanced police detachments and representatives of the North Caucasus diaspora; p 2 (600 words). 10. Yury Simonyan article headlined "Serzh Sargsyan remains president" says the presidential election results in Armenia have shown that a new opposition force has emerged despite the fact that Serzh Sargsyan was re-elected president; p 7 (587 words). 11. Viktoria Panfilova article headlined "Dushanbe flirts with Washington" says that in order to please Washington, the Tajik authorities are delaying the signing of an agreement on a military base with Russia. Dushanbe is changing priorities in its foreign policy, experts note; p 7 (701 words). 12. Vladimir Skosyrev article headlined "West gives more help to Syrian rebels" says the USA is considering the possibility of arming the Syrian opposition, while the EU is sending security advisers to help opponents of the Syrian regime; p 8 (510 words). 13. Oleg Vladykin article headlined "Ships do not leave Mediterranean Sea" says a detachment of Russian Navy ships is staying in the Mediterranean to help evacuate Russian citizens from Syria in case of emergency; p 8 (461 words). 14. Vladislav Maltsev report "They rid Islam of illegal ones" says that Russia is stepping up support of official clergy using security forces; p 4 (1,600 words). 1. German Petelin article headlined "Serdyukov and Vasilyeva refuse to give testimony" says former Defense Minister Anatoly Serdyukov and his former subordinate Yevgenia Vasilyeva have refused to answer the questions of investigators during the questioning at the Russian Investigations Committee; pp 1, 5 (400 words). 2. Ivan Cheberko article headlined "Defense Ministry rejects lunar craft project" says the Russian military have criticized a project to send a piloted spacecraft to the moon drafted by the Russian Space Agency; pp 1, 4 (574 words). 3. Anastasia Alekseyevskikh and Tatyana Shirmanova article headlined "Federal officials ask government not to sack them" says the Russian Subsoil Resources Agency, the Federal Anti-Monopoly Service and the Federal Tourism Agency have spoken out against the government plans to cut their staff; pp 1, 4 (597 words). 4. Konstantin Volkov article headlined "Fight for security agencies starts in Tunisia" says Tunisia is on the verge of a new revolution as the country's parties cannot come to agreement on the forming of the government; p 7 (458 words). 5. Igor Yavlyansky article headlined "EU does not dare to lift embargo on arms supplies to Syria" says the EU has voted to extend the arms supply embargo against Syria despite the opposition of the UK and France; p 7 (427 words). 1. Natalya Kozlova interview "Service for several persons" with Alexander Sorochkin, deputy head of the Russian Investigations Committee and chief military investigator, speaking on the probe into the Oboronservis corruption case and prospects of calling senior officials to account; pp 1, 9 (1,739 words). 2. Ivan Yegorov interview headlined "FSB to cast out lines" with Nikolai Patrushev, secretary of the Russian Security Council, speaking on the Russian defense strategy and prospects to develop an anti-asteroid shield; pp 1, 17 (1,934 words). 3. Yelena Kukol article headlined "Finance Ministry and its cars" says the Russian Finance Ministry is working on the luxury tax and cannot decide how to evaluate luxurious vehicles; pp 1, 5 (781 words). 4. Viktor Feshchenko article headlined "War without rules" says the UN has accused both sides in the Syrian conflict of war crimes against civilians; p 8 (500 words). 5. Fedor Lukyanov report "Fastidious bride" says that Delhi is dreaming about becoming the UN Security Council's permanent member; p 8 (800 words). 1. Olga Kuvshinova article headlined "Outflow under control" says that an inspection carried out by the Russian Central Bank has found out that a group of people controls over 50 per cent of transactions to withdraw money from Russia, which amounts to 49bn dollars; pp 1, 4 (794 words). 2. Yelizaveta Sergina et al. report headlined "Malofeyev starts dealing with Prokhorov" says that Konstantin Malofeyev, large private shareholder of Rostelekom, is conducting talks with Mikhail Prokhorov to sell his stake in the company; pp 1, 17 (610 words). 3. Editorial headlined "Championship of everything" looks at the financing mechanism of the Russian-Ukrainian football championship being organized by Gazprom; pp 1, 6 (443 words). 4. Another editorial headlined "Red and blue" looks at the causes hampering the Russian-EU talks on visa free travel; p 6 (265 words). 5. 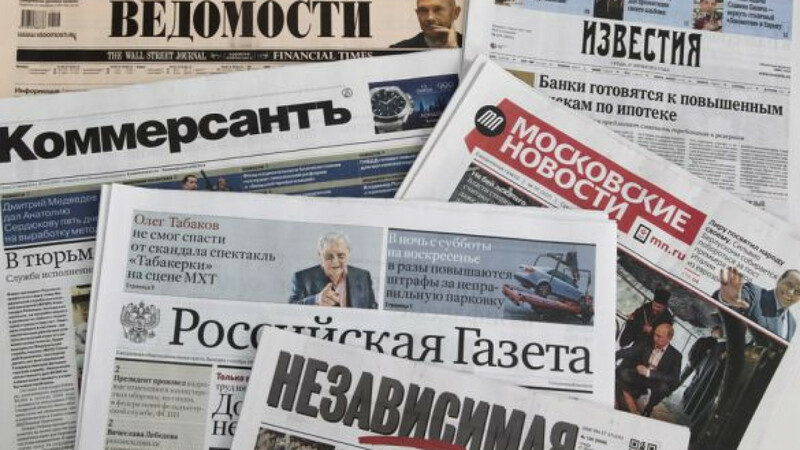 Andrei Kolesnikov report "There will be no round table" says that according to public opinion polls, more Russians assess the situation in the country as "increasing chaos" and "establishment of dictatorship"; p 7 (600 words). 6. Olga Plotonova interview with Russian Central Bank head Sergei Ignatyev speaking on measures to be taken to fight against money laundering and fly-by-night companies; pp 8-9 (3,727 words). 7. Anastasia Golitsyna report "Yandex's buyback" says that Yandex does not rule out it will buy back some of its shares from the market; p 16 (650 words). 1. Natalya Rozhkova article headlined "Birth front" outlines political plans of the All-Russia People's Front that has raised the issue of conditions at maternity hospitals to gain more popularly among the female electorate; pp 1-2 (421 words). 2. Mikhail Rostovsky article headlined "Maxim Kuzmin killed three times" says that another Russian orphan killed in the USA has become part of the political game between Russia and the USA; pp 1-2 (666 words). 3. Marina Ozerova report "Minute of concealing" says that the State Duma has observed a minute of silence for the Russian boy killed by foster parents in the USA; p 2 (550 words). 4. Yeva Merkacheva interview headlined "Forgive for first time" with head of the Russian Supreme Court Vyacheslav Lebedev; p 3 (800 words). 1. Anastasia Novikova article headlined "Socks VS foot wraps" reports on a survey conducted after the first approbation of a new military uniform; pp 1-2 (500 words). 2. Alexander Litoy article headlined "Games with children" says that the death of a Russian orphan in the USA has triggered furious reaction of the Russian State Duma and the Federation Council, while the opposition still opposes the anti-Magnitsky law banning US citizens from adopting Russian children; p 2 (500 words). 3. Yulia Yakovleva article headlined "Business above all" says that the One Russia party deputy Vasiliy Tolstopyatov has abandoned his deputy status after he got suspected of being involved in business activities. Pundits say Tolstopyatov chose business over politics amid the check of deputies' activities by the inspection bodies; p 2 (350 words). 1. Vera Moslakova article headlined "From untouchable to accused" says that yet another deputy, Oleg Mikheyev from A Just Russia party, has been stripped of his deputy immunity and his case passed to the Investigations Committee; p 2 (600 words). 1. Irek Murtazin article headlined "Mistake of deputy Pakhomov" gives details of the murder of Lipetsk Region deputy Mikhail Pakhomov and notes that the criminal scandal is linked with people surrounding Lipetsk Region governor Oleg Korolev; p 10 (1,176 words). 2. Vladimir Pastukhov article headlined "From Marx to Freud" comments on the latest developments in the case of Sergei Magnitsky; pp 8-9 (1,600 words). 1. Yulia Sharipova article headlined "Maxim Kuzmin, killed by foster mother, lived in same orphanage as Dima Yakovlev" features a report from the orphanage in Pskov, where Maxim Kuzmin was adopted; p 10 (400 words).